Even with modern techniques, the cutting and polishing of a diamond crystal always results in a dramatic loss of weight; rarely is it less than 50%. The round brilliant cut is preferred when the crystal is an octahedron, as often two stones may be cut from one such crystal. Oddly shaped crystals such as macles are more likely to be cut in a fancy cut—that is, a cut other than the round brilliant—which the particular crystal shape lends itself to. Because every facet has the potential to change a light ray's plane of travel, every facet must be considered in any complete calculation of light paths. Just as a two-dimensional slice of a diamond provides incomplete information about the three-dimensional nature of light behavior inside a diamond, this two-dimensional slice also provides incomplete information about light behavior outside the diamond. A diamond's panorama is three-dimensional. Although diamonds are highly symmetrical, light can enter a diamond from many directions and many angles. This factor further highlights the need to reevaluate Tolkowsky's results, and to recalculate the effects of a diamond's proportions on its appearance aspects. Another important point to consider is that Tolkowsky did not follow the path of a ray that was reflected more than twice in the diamond. However, we (Green et al.) now know that a diamond's appearance is composed of many light paths that reflect considerably more than two times within that diamond. Once again, we can see that Tolkowsky's predictions are helpful in explaining optimal diamond performance, but they are incomplete by today's (2001) technological standards. Figures 1 and 2 show the facets of a round brilliant diamond. Figure 1 assumes that the "thick part of the girdle" is the same thickness at all 16 "thick parts". It does not consider the effects of indexed upper girdle facets. Figure 2 is adapted from Figure 37 of Marcel Tolkowsky's Diamond Design, which was originally published in 1919. Since 1919, the lower girdle facets have become longer. As a result, the pavilion main facets have become narrower. The relationship between the crown angle and the pavilion angle has the greatest effect on the look of the diamond. A slightly steep pavilion angle can sometimes be complemented by a shallower crown angle, and vice versa. The table ratio is highly significant. So-called "painted" girdles have thinner girdles where the main facets touch the girdle than where adjacent upper girdle facets touch the girdle. These stones (such as EightStar-brand diamonds) have less light leakage at the edge of the stone (for a given crown angle, pavilion angle, and table ratio). Some diamonds with painted girdles receive lower grades in the GIA's cut grading system, for reasons given in a 2005 GIA article. The AGA standards may be the strictest. David Atlas (who developed the AGA standards) has suggested that they are overly strict. The HCA (Holloway Cut Adviser) changed several times between 2001 and 2004. As of 2004[update], an HCA score below two represented an excellent cut. The HCA distinguishes between brilliant, Tolkowsky, and fiery cuts. 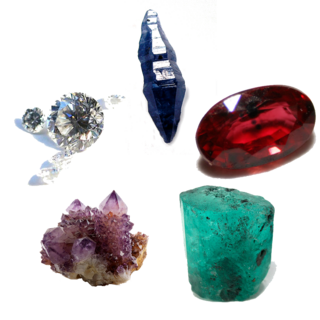 The American Gem Society (AGS) standards changed in 2005 to better match Tolkowsky's model and Octonus' ray tracing results. The 2005 AGS standards penalize stones with "cheated" girdles. They grade from 0 to 10. The GIA began grading cut on every grading report beginning 2006 based on their comprehensive study of 20,000 proportions with 70,000 observations of 2,000 diamonds. The single descriptive words are as follows: Excellent, Very Good, Good, Fair, and Poor. Polish and symmetry are two important aspects of the cut. 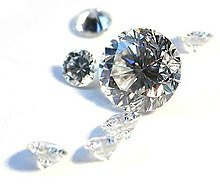 The polish grade describes the smoothness of the diamond's facets, and the symmetry grade refers to alignment of the facets. With poor polish, the surface of a facet can be dulled, and may create blurred or dulled sparkle. It may constantly look like it needs to be cleaned. With poor symmetry, light can be misdirected as it enters and exits the diamond. A diamond that has the top facet or "table facet" exactly perpendicular to the bottom of the diamond or "pavilion" and has its other facets precisely aligned with excellent symmetry, may show patterns that look like arrows from the top and hearts from the bottom. Generally it will need to be viewed loose under a gemscope to see the pattern very well. Although the hearts and arrows property is indicative of a top-tier cut, it does not always mean the diamond will be the most brilliant. Optimal facet placement is the key to brilliance and more important than facet patterning. Not all ideal round cuts will have the hearts and arrows effect either. ^ "Diamond Design--A Study of the Reflection and Refraction of Light in a Diamond--by Marcel Tolkowsky. Edited and corrected by Jasper Paulsen". www.folds.net. Retrieved 2017-12-12. ^ "Summary of: Diamond Design -- by Marcel Tolkowsky. Edited by Jasper Paulsen". www.folds.net. Retrieved 2017-12-12. ^ Garry Holloway (2001). "HCA: defining ideal cut diamonds (a detailed explanation of the "Holloway Cut Advisor")". ^ "OctoNus Software, Moscow State University, Bruce Harding, and others have posted work there". A diamond cut is a style or design guide used when shaping a diamond for polishing such as the brilliant cut. Cut does not refer to shape, but the symmetry, proportioning and polish of a diamond. The cut of a diamond greatly affects a diamond's brilliance; this means if it is cut poorly, it will be less luminous. In gemology, a culet is a flat face on the bottom of a gemstone.